KABUL, Afghanistan (AP) — A brazen and bloody overnight assault Friday by the Taliban on a key provincial capital in central Afghanistan has increased pressure on U.S.-backed Afghan forces that are withering under relentless attacks, prompting President Ashraf Ghani to call an emergency meeting of his security officials. The city of about 140,000 people was in lockdown as residents stayed indoors and reported sporadic gunfire. All shops were closed, they said, as was the highway from the capital of Kabul to Afghanistan’s southern provinces that runs through Ghazni. “The security situation in Ghazni is under control. Our defense and security forces are in full control of the city,” Rahimi said. Still, the Afghan forces were engaged in house-to house battles in some residential areas to root out the remnants of the Taliban’s attack force. Radmanish told The Associated Press the Taliban were driven to an area known as Hasanabad about 500 meters (yards) outside the city. Both the governor’s compound and central police compound were under the control of Afghan security forces. In a statement late Friday, Taliban spokesman Zabihullah Mujahid said the group held control of “several places in the city,” while the police chief had fled toward the airport. Lt. Col. Martin O’Donnell, a spokesman for U.S. forces in Afghanistan, said American forces and U.S. attack helicopters flew in overnight. As fighting continued throughout the day, he said U.S. forces returned, sending attack helicopters and fighter jets back to the area. “It is a show of presence,” he said. The Taliban attack came as President Ashraf Ghani contemplated a cease-fire offer to mark the Muslim holiday of Eid al-Adha later this month. The Taliban have rebuffed offers of negotiations with the government but have held one preliminary round of direct talks with Alice Wells, Washington’s top diplomat for South and Central Asia, including Afghanistan. 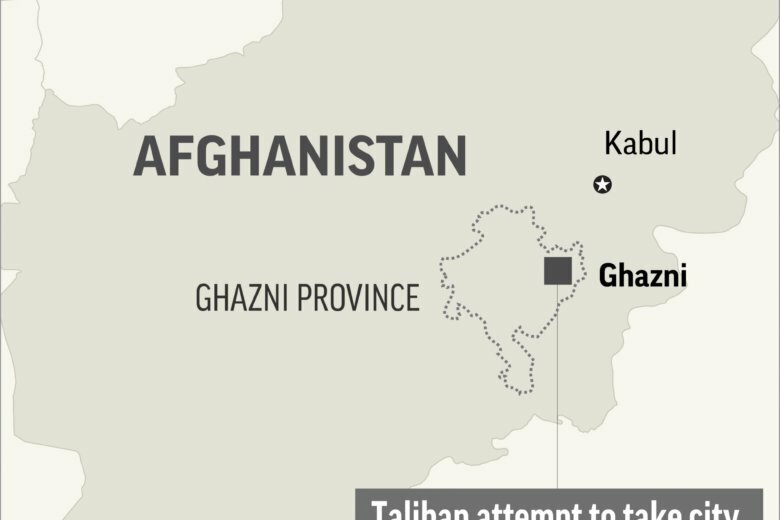 As the U.S. and Taliban explore the next round of direct talks, attacks like the one Friday on Ghazni are a reminder of the pressure faced by Afghanistan’s security forces. “His most likely move would be to revert to his earlier preference to more or less pull out of Afghanistan, leaving only a bare-bones counterterror presence, possibly secured by contractors,” Markey added. Gannon reported from Islamabad. Associated Press writer Maamoun Youssef in Cairo contributed.